The prospect of U.S. and Minnesota employers expanding into foreign countries is nothing new. One Fortune 500 manufacturer, Maplewood-based 3M, has run overseas operations for more than 80 years. But the recent opening of the world's biggest workforces in India and China has made foreign outsourcing common practice in many industries. Today, the phrase "Think Global" makes many industrial workers cringe -- even as business leaders salivate at the widening opportunities. We found both reactions along the same stretch of Twin Cities highway. Plymouth and Minneapolis, Minn. — To James Theisen's ears, the phrase "Think Global" translates more like: Think about another line of work. 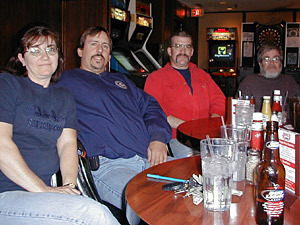 Theisen gathered recently with some coworkers at a restaurant just off Highway 494 in Plymouth. They work a mile away at a company called Nilfisk-Advance that makes floor sweepers and other industrial cleaning equipment. In this crowd, Theisen says "globalization" is not a welcome word. "I cringe at it because I've seen job loss," he says. "There's nowhere along the line since we've done business with Italy, China or Mexico that we've seen growth in our company. We've been told by our management team that we're going to grow as a company, and to a certain extent they're right. We're just not going to grow in Minnesota." Theisen followed his father to work at the plant, and became an official in the local union. As the company's manufacturing operation became more global in the past five years, Theisen watched his union workforce in Plymouth fall by more than half. The latest blow is a line of vacuum cleaners headed for China, taking a dozen or so jobs with it. An official with Nilfisk-Advance confirmed the company has been outsourcing more of its manufacturing. He stressed that this includes locations both overseas and in the U.S. -- including some in the Twin Cities. The company later declined to talk with MPR after learning we had spoken with union members. Paradoxically, the Nilfisk workers in Plymouth are themselves outsourced labor. Nilfisk-Advance is part of a Danish holding company called NKT Group. These workers believe the instructions from Denmark are to turn their plant into a low-skilled facility to assemble products headed for American customers. Chief union steward Mark Gutzke says higher skilled jobs are disappearing, leaving mostly entry-level jobs in assembly and in the warehouse. He calls the situation "degrading, to say the least." "Some people went to school for several years to learn these trades, some have worked here 25, 30, 35 years," Gutzke says. "If they would have told us five years ago that the machine shop is going to be gone and sheet metal is going to be gone and welding is going to be gone, we'd have sat back and said, 'yeah, right.' Well, in all reality, it is happening." These workers say once-solid labor relations have soured, and the shop floor is pervaded by "a sense of anger." James Theisen's wife, Lanee, has been laid off and rehired twice -- each time into a lower-skilled position. She says the spector of more "globalization" has become a pressure point used informally within the plant. "They've used it as a threat to us: 'If you guys can't build this fast or with this amount of money, we'll just move it overseas.'" Theisen attributes these sentiments to "management, supervisors -- verbal comments." Despite the bad feelings, these workers do not necessarily fault their company for its international operations. James Theisen says Nilfisk workers are confused because they can't know what's coming, and frustrated that the company's success does not seem to include them. "I don't really believe it can be a bad thing if everybody's doing it," he says. "There are people who are very educated, with double masters degrees, that are making these decisions. Somewhere along the line somebody has to be making money. We know it's not in the shop." If and when they lose their jobs, workers at Nilfisk are certified to receive state dislocated worker benefits, along with federal job-training benefits, known as Trade Adjustment Assistance, reserved for trade-related layoffs. Rich Caligiuri oversees both programs for the state Department of Employment and Economic Development. "I think we've seen a general increase in jobs going offshore, especially in the past three to four years as capacity has developed in China, for example," Caligiuri says. "As they've built industrial capacity, we've seen jobs leaving." Even as manufacturing employment enjoys a modest recovery in Minnesota, Caligiuri believes the "culture" of manufacturing companies has fundamentally shifted; the global era has ushered in a new devotion to maximum efficiency, by whatever means -- a survival instinct for companies now facing a literal world of competitors. That's why, for example, sheet metal jobs at Nilfisk outsourced no farther than Shakopee can still be considered trade-related. "Since the economy has truly become a global economy, we see job movement and retrenching and reorganizing and buyouts all the time," Caligiuri says. "The jobs don't necessarily go overseas." Recently, Caligiuri has seen the service-sector join manufacturing as a major focus of his office. In cities like Bangalore, India, a supply of eager, educated, English-speaking young people is an affordable solution for customer service and information technology work. Despite his constant exposure to layoffs, Caligiuri hews to the belief of many economists that globalization on the whole is both inevitable -- and good for the U.S.
"There's no doubt in my mind that we gain more jobs here than we have lost. That's my own opinion," he says. "But we are forever going to deal with this. With a global economy, 10 years from now, 20 years from now, there will be a new India and a new China." If workers at Nilfisk-Advance and other traditional manufacturers feel swamped by the wave of manufacturing in China, another company less than 20 miles down Highway 494 is surfing it to success. Minneapolis-based Softbrands make Fourth Shift, a software application that serves as the backbone of a manufacturing plant. The company got into China early. Fifteen years ago, before the boom, Softbrands set up a small team and began translating its software into simplified Chinese text. With the boom in full swing, Chinese plants now constitute more than half of new software contracts at Softbrands. "It's just 24 hours a day, absolute interconnected operations, and that's the way this world is going to work," says CEO Randy Tofteland, who visited the company's China headquarters in Tianjin in April. "We can either all step back and say, 'How can we stop all this?' which, on that case you are going to lose. Or we can say, 'How do we lead and participate?' Because that's the change of the world." The company's latest move was to launch another software product into China in April to manage hotel operations. Tofteland says the manufacturing boom is driving a related one in the hospitality industry as foreign and Chinese businesspeople become more mobile. Hotels are also going up in preparation for the 2008 Beijing Olympics. Tim Morin is a vice president who oversees Softbrands' foreign operations. He says manufacturers in China have embraced the latest technology and efficiency mantras faster than anyone had expected. Morin recalls a recent trip to a Chinese auto plant, marveling at the knobs and gauges coming together on a car dashboard in what seemed like record time. "And you're watching this and you're thinking, 'This is 21st-century, world-class manufacturing in China.' They would create a complete integrated cockpit for a car in 45 minutes," Morin says. "It's like nothing you've ever seen." Softbrands is a relatively small company. 130 of its 530 global employees work at its Minneapolis headquarters. CEO Tofteland says brainpower at home is driving the products it sells in China and elsewhere. "Just about all of our products, the early seeds of those have been germinated here in the U.S. someplace. And those initial seeds spawn a lot of employment and promotion growth for our employees here, and that then moves out around the world." Will software engineers in Minneapolis always have that edge? Tofteland can hardly make that promise. Good ideas can come from anywhere in the world, he says, and Softbrands will follow them to remain a global leader. Understand that, he says, and you begin to understand globalization.